Where is Provence? – Provence vineyards cover most of the southeast region of France. This region benefits from the mild temperatures of the south, with a definite added bonus: a touch of the mediterranean climate: hot, dry summers, mild winters, little snow, and abundant sunshine. Winds are an important feature of this climate, particularly the infamous “Mistral”: a constant breeze that sweeps the limestone soil and the typical landscape of Provence called “garrigue”. It carries around strong aromas of lime-tolerant shrubs such as lavender, sage, rosemary, wild thyme and Artemisia. You can feel the light breeze caressing your skin, and hear it whistling through the surrounding pine trees while napping under the shade of an olive tree… true bliss (Trust me, I speak from experience). Add to this the serene sound of the cicadas, and you get this curvaceous and elegant bottle. Doesn’t it just make sense? Though mostly used for rosé, this clear glass bottle is also used for red wine. Traditional winemaking in the Côtes de Provence still use this regional wine bottle which has a distinctive form that is between an amphora vessel and a bowling pin. Also called a “corset” by the locals, this bottle shape has been used for decades and it is not going away anytime soon. What is “vins de Provence”? – The main grape variety throughout Provence is Mourvèdre, which is the primary component in many wines of Provence (reds and rosés). Provence makes over 1,000 kinds of wines. The “vins de Provence” are often blended with Grenache and Cinsault, with the latter being used as a significant component in most rosé. Cabernet Sauvignon and Syrah are rising in prominence, though some traditional provençal winemakers view those grapes with suspicion and a sign of globalization and appeal to international tastes. For the last century, Carignan has been a major grape but as more producers aim for improved quality the use of this high yielding grape has decreased. Other significant grape varieties, used primarily in blending, include Braquet, Calitor, Folle and Tibouren. The major white wine grapes of Provence include the Rhône varieties of Bourboulenc, Clairette, Grenache blanc, Marsanne and Viognier as well as Chardonnay, Sauvignon blanc, Semillon, Rolle and Ugni blanc. Over its history, many grape varieties grown in Provence are now nearly extinct. 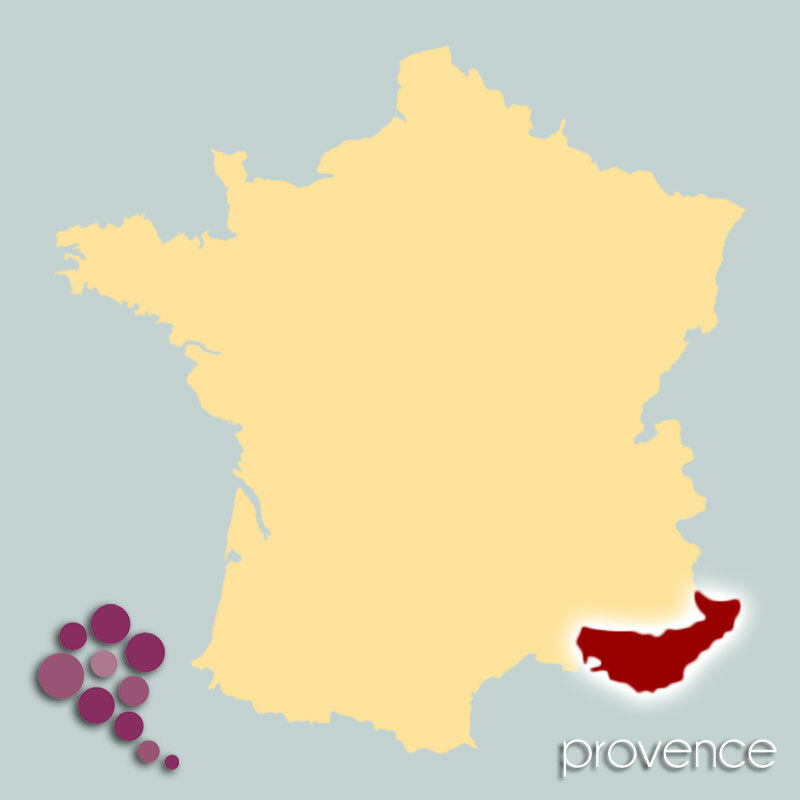 Provence’s wine production includes Reds (15%), Whites (5%) and Rosés (80%). • Red wines are appealing to most wine drinkers as they keep on improving. Red wines from Côtes de Provence are generally quite strong however in some areas they can be light and delicate. They should be served at 57-60°F for young wines and 60-63°C for aged wines. • White wines from Provence are excellent with local seafood. Top-shelf whites, aged in barrels, will pair beautifully with white meats, and even goat cheese. And if you’re not eating and would prefer to lounge and relax while sipping on wine, they also make an excellent “apéritif”. They should be served at 43-46°F. • That leaves us with the Rosés. Provence is very popular for their rosés, also known as the “pink” wine. Take a look at the wine’s beautiful salmon color and you will fall in love instantly! When to drink “pink”? – Rosés are perfect for spring and summer, as they are served chilled for “apéritif” and can be a refreshing accompaniment to a variety of warm weather fare. Rosé wines also top the charts for food-friendly versatility. They can handle both the seafood and the steak in one fell sip. It’s also a great picnic wine, as it tends to have both a lighter body and more delicate flavors on the palate, presenting a great wine partner for a ham, chicken or roast beef sandwich, along with a fruit, potato or egg salad and can even handle a variety of chips and dips. Rosés are also the perfect guest for a backyard barbecue, tackling hamburgers, hot dogs and even French fries and ketchup with ease. They offer savors you won’t find anywhere else, and they are the perfect accompaniment for provençal dishes, such as ratatouille, sea bass with fennel, mullet filet with thyme and spices, aïoli, soup with pesto (aka “Soupe au Pistou”), and the famous “bouillabaisse”. They should be served at 46-49°F. Cheering is a practice that every single culture carries with pride. So as they say in Provence Mistralienne for their traditional cheer: “Vivo santo e Prouvènço”, which means “To health and Provence”.